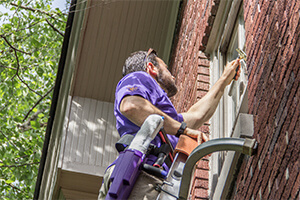 Established in 1994, Window Genie has been dedicated to improving the look and value of homes and small businesses by specializing in window cleaning, tinting, pressure washing, gutter cleaning and more. Like all Neighborly brands, we are locally owned and operated. WE WERE VERY HAPPY WITH THE OUT SIDE WINDOWS. THE TWO PEOPLE WERE VERY FRIENDLY. WE ARE PLEASED WITH THE RESULTS. The guys did a great job inside and out. They let me know exactly how much it would be before they started and got straight to work. Very pleased. They did a good job pressure-washing my house. The price was reasonable. He arrived promptly and did the sort of good job you'd expect someone to do on their own home.